All the Middling and Tails material were disposed of in the tailings pond. Despite this, each of the products did contain appreciable gold that was unable to be recovered by the shaker table. Each day, samples were taken from the Tailings and Middlings launder, and this served as a measure of the amount of gold that could not be recovered with the mill. The samples were collected in 5-gallon plastic bags and were sent to MS-Analytical for analyses of gold and 32 element ICP for trace elements. 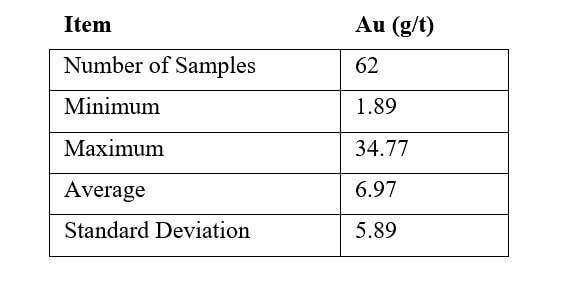 This data is extremely useful in assessing how much gold was not recovered, but also in gaining a better understanding of the chemistry of the SIF gold-bearing zone in general. It should be noted that about 90% of the material going to tailings pond was in the Tailings launder, and the remaining 10% was disposed of into the Middling launder. Tailings - The gold content of the tails was completed on 62 samples. As one would expect, this showed less gold reporting to the tailings launder, but it was still on average about 4.29 grams/tonne. 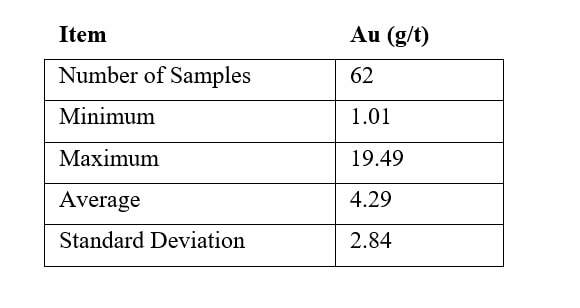 The variance was also less, and this would be expected since the tailings would be less likely to receive any pieces of coarse gold moving along the riffles in the shaker table. Middlings - A total of 62 middling gold analyses were collected over a period that extended from 7/16/2017 to Oct/5/2017. The table to the right summarizes the statistical information from those samples. This data shows that there is a considerable amount of gold that was going to the Middlings launder (6.97 g/t). 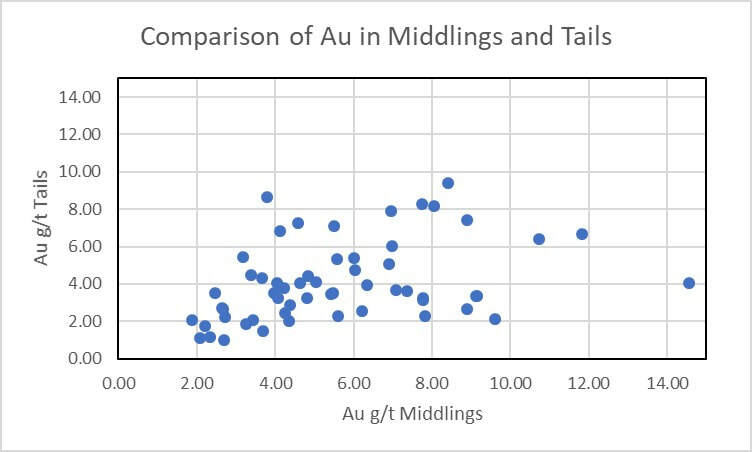 A comparison between the Tails and Middlings should show that the amount of gold in the Tails for sample pairs taken each day is less than the gold content in the Middlings, and this is precisely what is seen when a plot is constructed showing the results for each of the products from the shaker table. The reason for this is that the Middlings are more prone to collect gold since it is located further along on the shaker table closer to the Super-Concentrate and Concentrate launders where the bulk of the gold is recovered from the shaker table.